Snob's Music: Thurston Moore's new band Chelsea Light Moving: "Burroughs"
Thurston Moore's new band Chelsea Light Moving: "Burroughs"
It didn't take long for Thurston Moore to pick up the pieces after Sonic Youth. 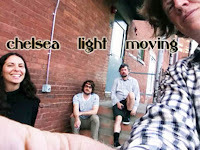 He's got a new band, Chelsea Light Moving, already. They have a handful of tour dates already (including Sled Island for the lucky folks around Calgary) and it a deal with Matador. Listen to the first track "Burroughs" now.